Everyone has been asked the question "If you were on a deserted island, what 3 items would you bring with you?" Well mine are listed above. 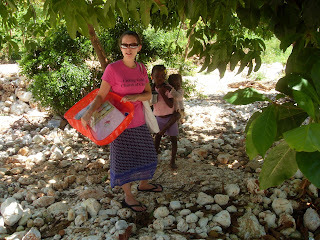 These items have become my "staples" in Haiti this week. The bugs and ants seem to love the taste of my skin. Let's just say my feet and legs are NOT a pretty site right now. Beef jerky is my source of meat after I went to market the other day and saw where the meat is sold-out in the open, hot sun with flies swarming. (If you're on a diet picture that next time you want to snack). I think the last item is pretty self explanatory. I have been in Jacmel this week which is on the south/east portion of the island. I am staying with a missionary who has lived here 25 years and the porch overlooks the ocean. When the generator isn't running I can sit on the porch and hear the lull of the waves. If it wasn't 110 degrees outside I would sit out there more often :) All kidding/complaining aside this is a beautiful area of Haiti. It's more "country living" than in the capital. At night it is so dark the stars shine bright. It reminds me of the verse in Philippians 2:14-15, "Do everything without complaining or arguing, so that you may become blameless and pure, children of God without fault in a crooked and depraved generation, in which you shine like stars in the universe." Looking at these stars I think about the benefits of being a child of God. 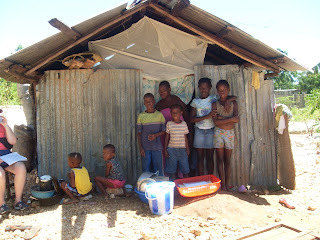 We went to the market here in Jacmel the last 2 days and bought things for some hurricane victims. We bought dishes, silverware, toothbrushes, soap, towels, sheets and various cooking utensils to hand out to 24 families in the area. 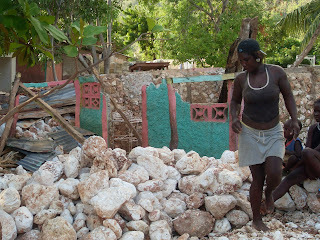 Some of the homes were completely destroyed while others were just washed out- meaning all their possessions are gone. We came back to the house and with the help of a couple Haitians we divided all the goodies up and are planning on delivering them after church tomorrow. I look forward to this opportunity to be a representation of the Christian church. Thank you to everyone who has "sent" me to be this representative!